Jordan Garvey, an employee at Genus Landscape Architects and a recent ISU grad was a first-time snapshot volunteer. 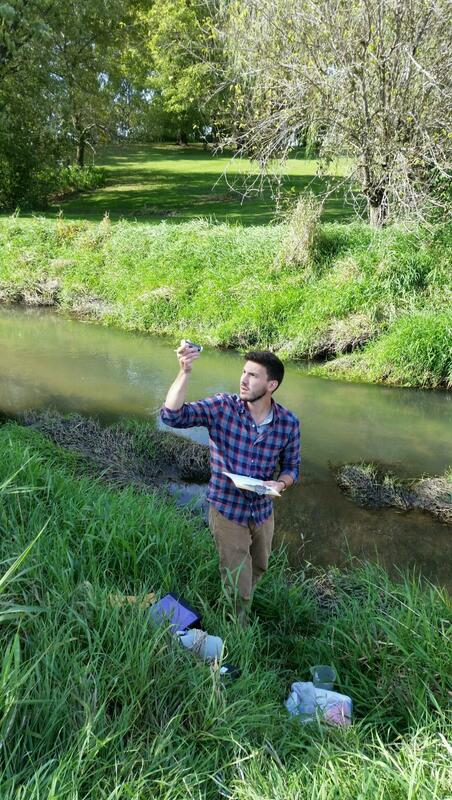 Yesterday, Oct. 7, 34 volunteers participated in the fall Polk County Water Monitoring Snapshot, and took samples of water at 65 stream, lake and pond sites in Polk County. The biannual event, which is in its 12th year, is organized and sponsored by the Iowa Environmental Council, the DNR IOWATER program, Des Moines Water Works, the Des Moines Izaak Walton League, and the Raccoon River Watershed Association. Samples will be assessed at Des Moines Water Works’ lab and results will be uploaded to the IOWATER volunteer database. Data collected provides a “snapshot” of Polk County’s water quality and allows the County’s water quality to be compared year-to-year. The project gives insight into problem areas, the nutrient impacts from lawns, gardens, golf courses and more, as well as involves the public in the water quality issue here in Iowa. The event uses DNR’s IOWATER equipment and supplies to do field tests and collect water samples. Several cities in Polk County provide city staff to sample in their communities including Johnston, Ankeny, Clive and Pleasant Hill. The City of Des Moines Parks Department also provides a crew to sample ponds in Des Moines City parks, Polk County Conservation provides staff to sample the lakes and ponds in county parks, Polk County Soil and Water Conservation District helps with sampling of Four Mile Creek, and Wells Fargo provides several volunteers. The next Snapshot will be held in spring 2016. To volunteer for future events, please Contact Susan Heathcote at heathcote@iaenvironment.org.